It is widely known that a large variation exists in the primary pattern of European Herring Gull Larus argentatus. It is interesting to see though that subtle variations also occur in different moult cycles of an individual gull. 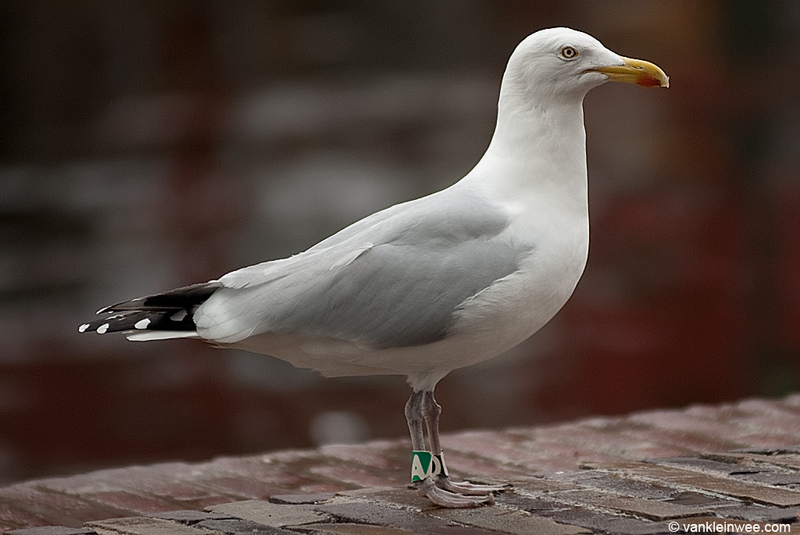 The gull in question is a male [edit: 2015: based on measurements taken when ZDGA was re-ringed as Green FAMA, it turned out to be a female] European Herring Gull (Larus argentatus argenteus), ringed as a juvenile in July 1986, near The Hague, The Netherlands. European Herring Gull, ringed as Black D – Green A as a juvenile in 1986. Leiden, The Netherlands, April 2011. I have been following this gull extensively since June 2009 and have taken literally hundreds of photos of him, many of which are flight shots showing great detail of the wing pattern. At first glance, the primary pattern looks identical for each moult cycle, but when comparing them in more detail, very subtle differences can be observed. Primary pattern of left wing in European Herring Gull, ringed as Black D – Green A.
P10: variation in the amount of black between mirror and primary tip; variation in mirror shape. P9: variation in shape of black base on outer web; variation in the presence of small white mirrors on either the outer web or inner web. P8 & P7: variation in shape of black base on outer web. P6: variation in the amount of black. P5: variation in size of black spot on outer web. Primary pattern of right wing in European Herring Gull, ringed as Black D – Green A.
P10: variation in mirror shape. P9: variation in the presence of small white mirrors on the outer web and inner web. Although the differences are very subtle, they definitely exist. * The calendar years actually represent the moult cycle that was completed at the end of the previous calendar year; I’ve decided to refer to calendar years instead of moult cycles (in the 28th calendar year the 27th moult cycle was scored) for readability reasons. It would be fascinating to compare such variation in other individuals of large gull species. If you are able to perform a similar comparison for a particular individual, please let me know.